The open source Sound eXchange (SoX) project is a Swiss Army knife of sound processing programs according to it’s homepage. SoX can convert various sound file formats into other formats (commonly referred to as transcoding). SoX is also cross platform and can be compiled as a dynamic and static library. I wanted to access the SoX library from Delphi XE7 Firemonkey and Appmethod on Android, IOS, Windows, and OSX as a proof of concept to see how difficult it would be and how much it cost to get it working. I hired two developers via oDesk to accomplish this task. The first developer had the task of compiling the static and dynamic libraries for each platform and for providing a working demo in a language from that platform. The second developer had the task of converting the header file into Object Pascal and translating the demos from each platform language into Object Pascal for Firemonkey. It cost around $2,200 to get a working copy of the libraries on all four platforms and mostly working demos in Object Pascal for Delphi XE7 Firemonkey and Appmethod. For creating the libSOX static library for IOS we followed instructions that we found here and here. I assume that for Mac OSX that we just modified the IOS version or the developer used his own initiative to make it happen. For creating the libSOX shared objects for Android we followed instructions that we found here and here. For creating the libSOX DLL for Windows we followed instructions that we found here. For IOS we went with a static 32bit library (.a file). We have not created a 64bit version of the static library for IOS but if you REALLY need it contact me and we’ll get it done. There is a universal libsox.a file (32bit+64bit) linked at the bottom. For Mac OSX we went with a dynamic 32bit library (.dylib). For Android we went with 32bit Shared Objects (.so). For Windows we went with a dynamic 32bit library (.dll). 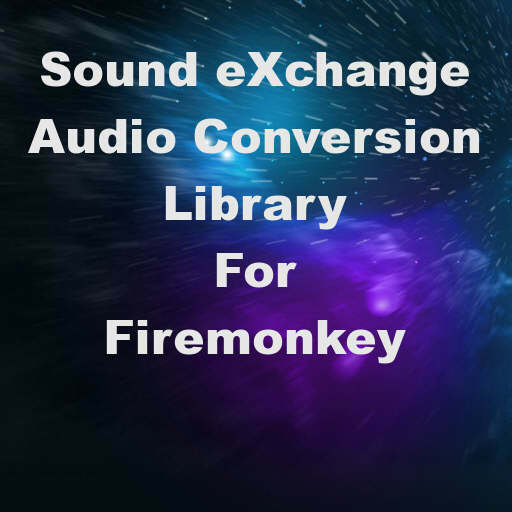 The Firemonkey versions work on Windows, IOS, and Mac OSX. The Firemonkey version for Android loads the shared objects but does not successfully use the library yet. If you figure out how to get the Android version working in Firemonkey feel free to contribute back the working project and I will include it here. There are a lot of files here so if you’re attempting to get this working and something is missing leave a comment and I’ll see if I have it. Download the full source code of libSOX for Delphi XE7 Firemonkey in Object Pascal plus demos for Android, IOS, Windows, and OSX. Download the full source code of libSOX for Android including Java source code and project demo for Eclipse. Download the full source code demo of libSOX for IOS and Mac OSX with project demos in XCode. Download the libsox.a 32bit+64bit static library and compile script. And download just the dynamic library libSOX file for Mac OSX. Download the full source code demo of libSOX for Windows with project demo for Visual Studio. Wow! Thank you so much for your contribution to the Delphi community. Going to try this! Hi, can you provide 64-bit library please? As far as I know we need it so apple can take our apps to iTunes. Here is my mail: lotierm @(at) gmail.com.